Do not settle for a worry-free, comfortable life with an unhealthy attachment to money and an ambitious heart yearning for honors, Pope Francis told seminarians studying in Rome. "I'm telling you this as a brother, father and friend. Please, shun ecclesial careerism. It is a plague. 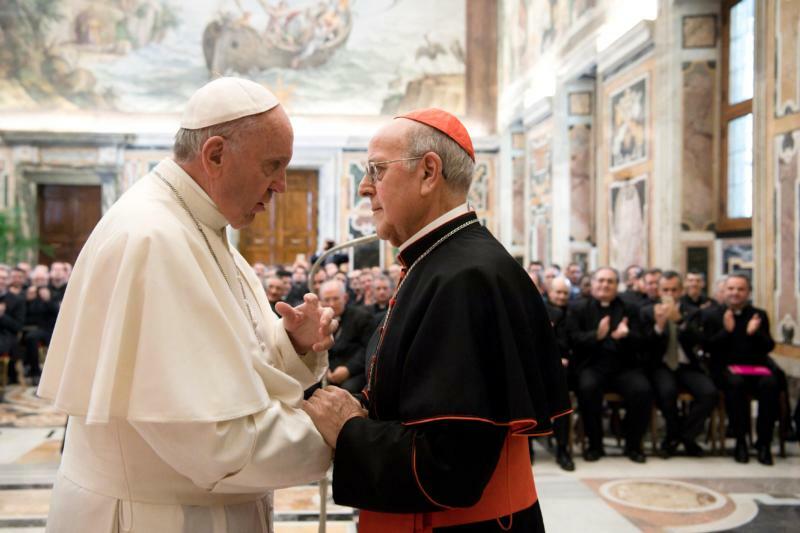 Avoid it," he said on April 1 during an audience at the Vatican with students, faculty, staff and alumni of the Pontifical Spanish College of St. Joseph in Rome. The college was celebrating the 125th anniversary of its founding. Everything hinges on loving the Lord with all of one's heart, soul, mind and strength, he said, citing the Gospel of Mark (12:30). That is what determines whether a person will be able to say "yes" to Jesus or turn one's back on him like the rich young man did in the Gospels, he said. "You cannot settle for leading an orderly and comfortable life that lets you live without worry unless you feel the need to cultivate a spirit of poverty rooted in the heart of Christ," the pope said. Priests must have "an appropriate relationship with the world and earthly goods" if they are to gain authentic freedom as children of God, he said. "Do not forget this—the devil always comes in through the pocket, always." Give thanks for what one possesses, he said, and "generously and willingly renounce the superfluous in order to be near the poor and weak." While Pope Francis said he wasn't asking them to "sell their shirt" like Blessed Manuel Domingo y Sol, the college founder, asked people to be willing to do, the pope said he was asking them to be witnesses to Jesus through a lifestyle based on "simplicity and austerity" so as to be "credible proponents of a true social justice." Priestly formation cannot depend solely on academic formation, which breeds "all the ideologies that infect the church with every type of clerical academicism." Studies must intertwine academic, spiritual, community and apostolic formation all together, and when one of these four legs is missing, he said, "formation begins to limp and the priest ends up paralyzed."